McLeod's Body Shop is a long-time expert in bumper replacement and repair, servicing Ashland KY-area customers since 1981. 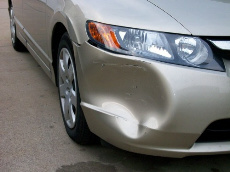 Bumpers are notorious for getting scraped, scratched and dented in parking lots, which ultimately degrades the value of your car. Fortunately, bumpers are the least expensive repair to improve your vehicle’s look. In many cases we can repair your car in one day.